For any of you following my excursions with our "Christmas Tree for the Birds," the cutest thing happened this past week. The other day I noticed that the tree was shaking more than usual. I looked out and there was a small red squirrel in it. These squirrels are pretty new to me. We have always had the big gray squirrels sharing the bird feeder, and occasionally a chipmunk, but we have just started seeing these red squirrels around our area. A picture you say? Well, every time I would try to sneak up on him he would run away, or the dog would "attack" him through the sliding glass door--if dogs could bruise. So there is no picture, but he was just loving the pine cones with the bird seed. I caught him trying to take the pine cone with him. (I don't really know if it was a male or not). 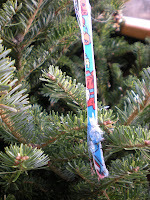 That poor squirrel pulled and tugged, gnawed on the ribbon, pulled and tugged, but to no avail--he got quite frustrated, zooming in and out of the tree. 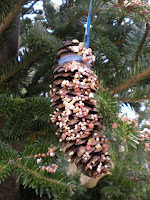 So this weekend I go out to fill the bird feeder and I thought I would replenish the pine cones. Guess what I found? 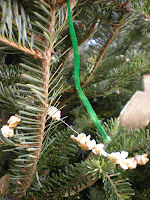 Two ribbons without pine cones. Now, I wonder where those pine cones could be? 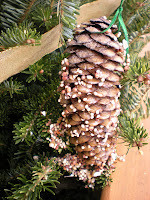 Also, I used the honey to put more bird seed on the pine cones and I did not have huge luck. The honey kept running off taking the bird seed with it. I would think the best thing to use to avoid the allergies is the suet suggested by Julianne from nurturing curiosity. What a great post! Too bad you couldn't get a photo of the little critter. We've had a large rabbit in our backyard that I've been growing fond of, because it has been there for a while now nesting under my table. Well, I haven't seen it in a couple of days- I'm hoping it will come back. Kinda got used to having it around-even was feeding it carrots! HI Trish - Just stopping by to let you know I awarded you..... THE LEMONADE AWARD!! Great job on your blog, and congratulations! !